The perfect presentation box for proofs or albums that will last as long as their memories. Images Boxes are made using sturdy wood construction and can be ordered with any cover option available in our Art Album line. 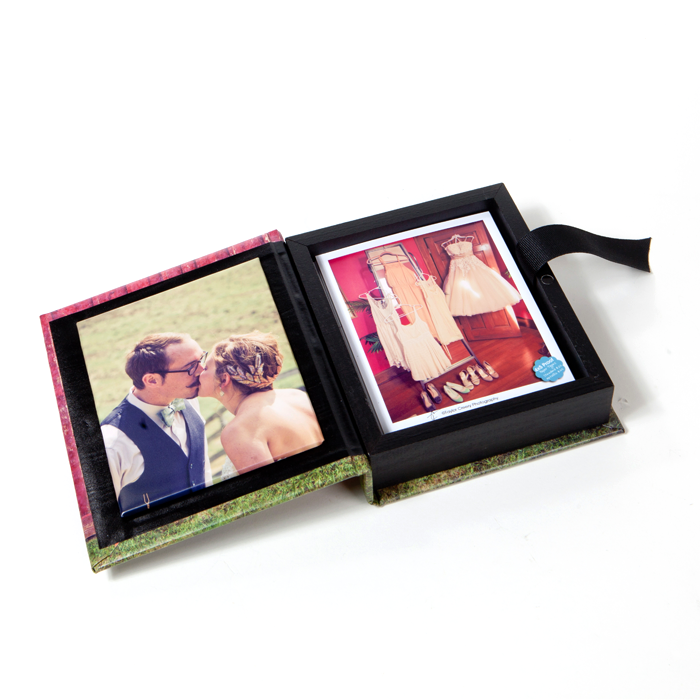 Image Boxes have the option of a photo panel on the inside cover, and both image and album boxes come standard with magnetic closure. Matte and Lustre laminate are available for both box types. Album boxes available in 6 sizes to complement all albums. All cover options are available. All inside dimensions of image boxes are 1/4″ larger than the product size – example 4×6 is 4-1/4″ x 6-1/4″. Can I add a CD hub? Can I only print on the front cover and have the back/spine blank? Yes, just create your file that way in Photoshop.